This is Swayne Martin. If I had managed to get into aviation a little sooner, and if I have been born a little later, I like to think that I would be as focused, optimistic and communicative as him. I could be kidding myself. I follow blogs like pieces of pasta. Delicious, informative pieces of pasta which I slurp up as one is connected to the next. I would love to be able to piece together how I found Swayne, but I only know that I read his story on Karlene Petitt’s blog. And I think that Sam’s blog pointed me to hers. But the gist that I was following was that Swayne had asked in a public forum about becoming a professional pilot and someone had dumped a bucket of cold water on him. (There are some very bitter pilots out there, in case you were wondering.) And there were a few positive bloggers who then made sure to encourage him instead. I enjoyed reading Swayne’s reports about learning to fly. I am not a big Twitter user, but I followed him there. That only helps when I am in line at the grocery store, so I don’t read many tweets. But I saw one the microblogging site that he was headed out here to Los Angeles. I messaged him my email address and set up a time to meet at Santa Monica’s little airport. 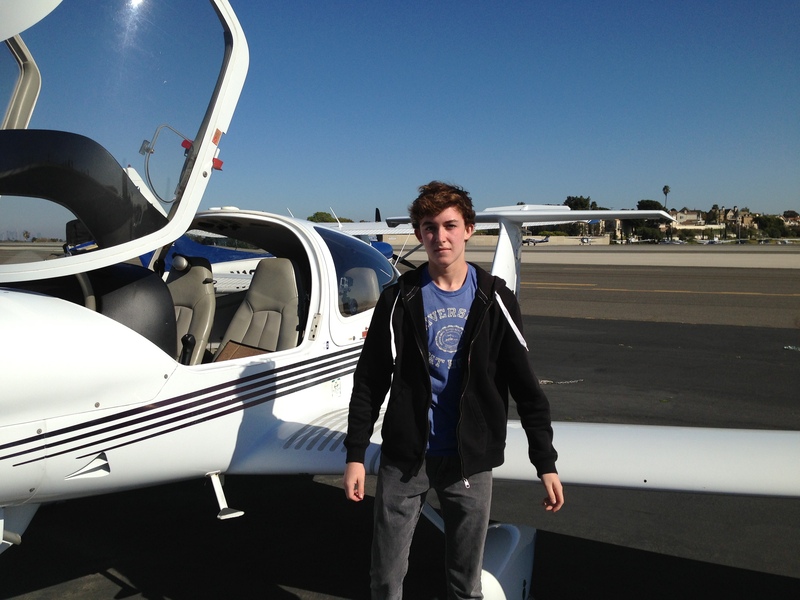 We went for a short flight in the Diamondstar and he wrote it up on his blog. I have nothing to add to his entry other than when he took the controls he was incredibly smooth, much more in tune with the airplane than I was when I had that few hours. If that’s an indicator it would seem like he has a good flying career ahead of him.